There is a reason why this post is about twelve hours later than I intended it to be. It took that long for me to get out of the neighborhood of the canonizations! All the roads in and out of the area were closed down, so no taxis were available, and the buses, though advertised as running, where nowhere in evidence during the hour and a half I waited! But don’t get me wrong — I wouldn’t have missed any of this for the world. Let me tell you about the day itself as some of us experienced it. I haven’t seen any of the TV coverage yet, but here’s what some of us saw and experienced. 2:45 AM: Got up to get ready for the trip to Saint John Lateran, where we are to meet the buses. 3:45: At St. John Lateran, and I’m the only person here! Did I misinterpret the instructions we’d been given? Am I in the right place at the right time? I decide to wait until 4:00 before getting too concerned. I sit on the steps of the Basilica and wait. 4:00 AM: Cars start dropping people off and soon there are dozens of people milling about. The first two buses arrive; there will be eight altogether. 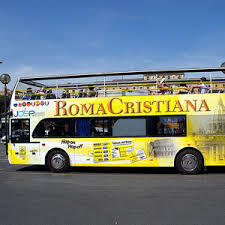 But here’s the funny bit: If you’ve ever been to Rome, you’ve seen the “Roma Cristiana” double decker buses going everywhere. Well, those are the buses that have been chartered for us this morning! We all feel like we’re going on a tour! 4:15 AM: The Navy officer in me has to admit that the Romans have organized this well, with great precision and attention to detail. There’s a monsignor here who could pass for Patton in his ability to get the right people on the right buses! I’m on bus number two, along with a group of Polish priests and part of the Vatican choir. Interesting groups! 5:00 AM: Right on the dot and right on schedule, we leave. Best trip I’ve ever taken to get around Rome. Carabinieri on motorcycles lead the way and act as traffic controllers as our eight buses make a quick trip over to the Vatican. I’m on the upper deck, so the view is really cool. 5:30 AM: We arrive at the Vatican, next to what used to be known as the Holy Office (“Sant’Uffizio”). How to describe the scene. Bedlam? Chaos? As we were approaching, the crowds exploded in numbers. There were groups already walking toward the Vatican, with their leaders holding up the guide flags as if they were strolling around at lunchtime! All over, there were groups starting to wake up after camping on the streets on pads, cardboard and blankets. People were crowding along the bridge approaches, and the underpass was packed. When we arrived, we were rushed off the bus and told to wait in a group nearby for further instructions. 5:45 AM: We were now given NEW credentials to participate; these were from the Vatican itself (the previous credentials were from the Vicariate). 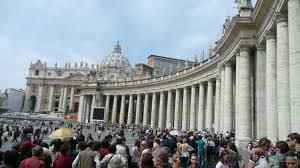 We were then escorted “a piedi” (by foot) around St. Peter’s and the Via della Conciliazione. And then I saw a remarkable sight: As we approached the Ancora Bookstore (on the right) and the Vatican Press Office (on the left), we saw security people at barricades. Beyond them, stretching across the entire street and extending down all the way to the Tiber, was a sea of people. I wish I’d had a camera to record the images. Rather eearily, they were relatively quiet, standing there. In the darkness, it was more than a little surreal! Down the center was a narrow walkway kept open by metal barricades, and we were escorted down this path. It was also being used by the emergency services people to help people who had collapsed or were in need of assistance. Some groups sang softly. We quickly made our way to Santa Maria in Traspontina, but then there was a snag. There was no way to get from the center of the street into the church! After about a half hour of phone calls, working the walkie-talkies, lots of gestures and shouting, a pathway was negotiated and we got into the church before the throng filled up again. 6:00 AM: In the quiet, darkened church we found places to sit and get comfortable. The photo to the left was obviously taken during daylight and without the crowds in front of it! All of us priests and deacons had little bags with us carrying our albs and stoles, so we settled in quietly and prayed for the safety of those outside. We were welcomed by the pastor of the church and invited to make ourselves comfortable. 7:30 AM: We began Morning Prayer together, led by the pastor and a (transitional) deacon; more about him later. 8:00 AM: We began the celebration of Mass in the church. Long tables were arranged behind the altar itself, and there were literally dozens of ciboria filled with hosts arranged there. During our Mass, all of these were consecrated and would be the Hosts we would distribute later to the people outside gathered for the Mass of Canonization. It was a beautifully simple Mass. No musicians except for one of the deacons who served as cantor to get us going. We sang a cappella and kept thinking and praying for the pilgrims outside. It was like we were in a bubble of prayer. Oh, and here’s the deacon who assisted: ever wonder what happened to the actor who played Tony Almeida on the series “24”? He’s here in Rome, a deacon at this church! 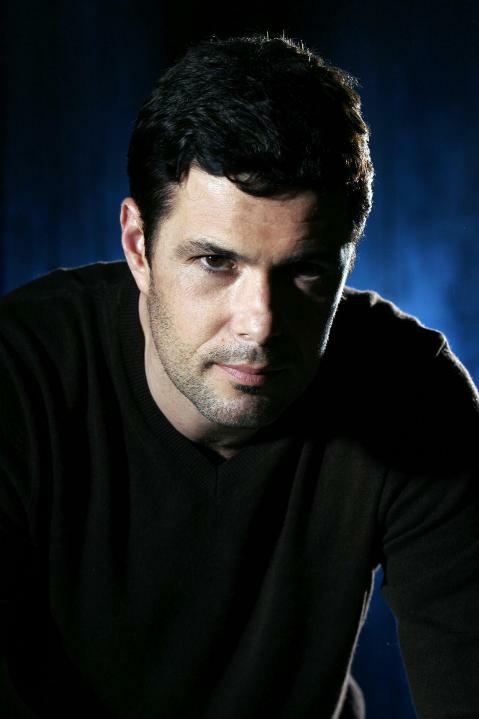 Seriously, if this isn’t Carlos Bernard, they could be twin brothers. 9:00 AM: After Mass a large screen was set up so we could follow the Mass of Canonization, which was to start at 10:00. More than just for our entertainment, we were told that we would be timing our own movements based on the Mass. 10:00 AM: The Mass begins as the Pope enters. Here we go. Our schedule is like this. 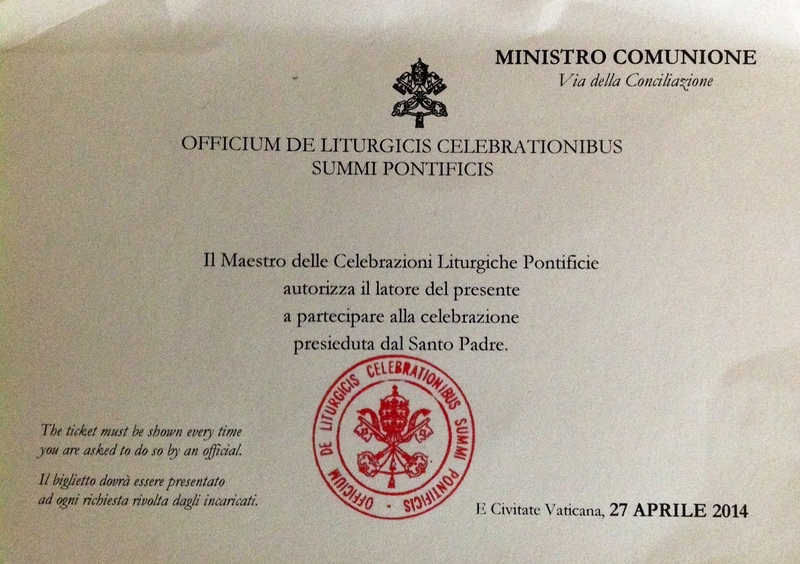 After the pope’s homily is completed, we are invited to vest. We quickly put on our albs and stoles and form two lines leading into the sanctuary. 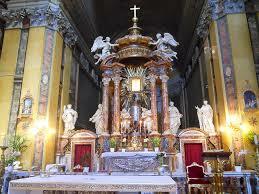 We each take a ciborium and the line forms heading to the front doors of the church. 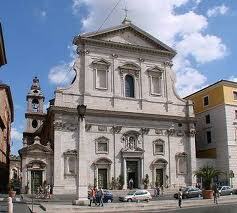 As soon as the Lord’s Prayer begins at St. Peter’s, they open the doors of Santa Maria, and out we go, two by two. We move to the central path I mentioned before, and turn immediately to the left, AWAY from St. Peter’s and toward the Tiber. Every ten meters or so, one of us “drops out” of line and stands in front of the crowd. I’m toward the end of the line, so I wind up where I’d hoped to be all along — down near the Tiber. I notice something I hadn’t before: the cross street where I am standing, getting ready to distribute Communion, is named after St. John XXIII. Those who know of my love for St. John will realize just how special this location was! I’ve marked my location on the map at right. 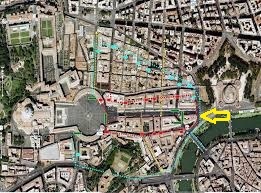 You can see St. Peter’s on the left, and I was standing as indicated by the yellow arrow on the right. We all turned to watch the big screen TVs, and as soon as the Pope had finished his own Communion, we turned and began distributing communion ourselves. How to describe the moment? First we were up against barricades, surrounded and assisted by carabinieri, and people had to struggle to get to us as we reached as far as we could into the crowd. We had been told to distribute Communion only on the tongue, and not into the hand. The wisdom of this became quite apparent. Some people were holding up their hands, and indicated how many hosts they wanted, like they were asking for seats in a restaurant! But most were as reverent as if they were in church. We offered Communion with the Latin words, “Corpus Christi”, since there were so many different cultures and languages present, it was the only way to communicate. I didn’t stay just in one place; I tried to move to different positions so people could get forward more easily, and I noticed that all of us were doing that as well. For all of the crowds, this was an amazingly intimate experience, sharing the Body and Blood of Christ with so many people who simply wanted to be part of this sacramental moment in time. After about 10 or 15 minutes, I had no more hosts, and began making my way back to the Church; by the time communion was finished in St. Peter’s, we were finished as well. As the Pope was reading the Prayer after Communion, all of us were back inside Santa Maria. A crew from the Discovery Channel was present with us, and I was interviewed briefly after the Mass, and then — it was over! The pope did a drive-by along the route, but even he had trouble navigating through the crowds! The rest of the day, as I said at the beginning, was spent trying to navigate my way OUT of the area! The rains held off during the ceremonies, thank God, but they began in the early afternoon, making walking around the area pretty cold, damp and miserable! 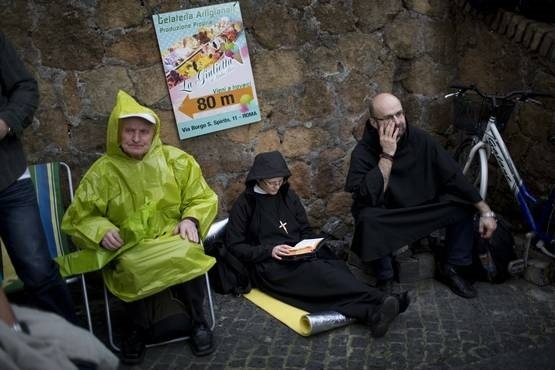 I even dozed for a while on the steps of the Vatican Press Office waiting for the rain to let up a bit. Finally, about 8 PM, things were relatively normal, I found a taxi, and headed to the residence. I can’t describe adequately how special this time has been. Not only pertaining to the two new saints of ours, and all of the attention being paid about whether or not this should be done, or if one or the other of these two men should be declared a saint — whatever! What has been the most amazing thing has been the people, from all over the world, here to celebrate their faith and their love. So often, we think of “church” in terms of our own parishes. True enough. Sometimes, we think of “church” in terms of diocese or country — also, true enough. We can get critical and say, “Why doesn’t the Church do _____?” (Fill in the blank with your own ideas here.) But experiencing the Church like this, from Poles who can’t ever get enough of St. John Paul II, who restored their own national pride and sense of freedom and solidarity, to the people from Bergamo whose love for St. John XXIII was just as palpable, to the Americans, French, Chinese, Belgians, Sudanese, Sardinians, Romans, Spanish, Germans, Netherlanders, Africans from every country on that continent, Koreans, Filipinos, Australians, New Zealanders, and Brits, plus others I’ve forgotten: THIS is the face of the Catholic Church, and this is the kind of impact Pope Francis is having on the enthusiasm and the joy people brought with them to Rome. Were there problems? Oh, you bet! Will people go home with bad experiences along with the good? Undoubtedly. But for the majority of people, those inconveniences and challenges were nothing compared to the overall joy of being here and being together. The pace of life in and around St. Peter’s is really so full of energy and enthusiasm right now, the best word I’ve seen to describe comes from NCR reporter Joshua McElwee — a carnival. The constuction and preparation of the altar and platform and other structures in the Piazza is one thing. I’ve lost count of the various national and regional flags, the languages being spoken, and even the number of times street vendors have approached with the finest souvenirs ever made! Really! They told me so! Everything is new and fascinating in this Eternal City right now, at least the parts closest to the Vatican. New structures have been built, especially the press scaffolds and so on. 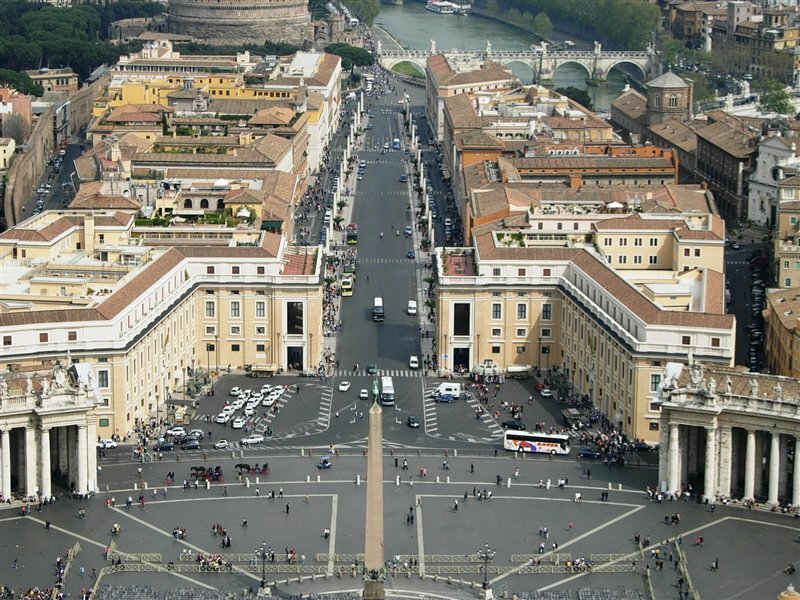 Traffic has been completely re-routed around the Vatican, and most of the shops and cafes and restaurants will be closed all day tomorrow because of the press of the crowds. It has been another wonderful day with friends and new acquaintances. 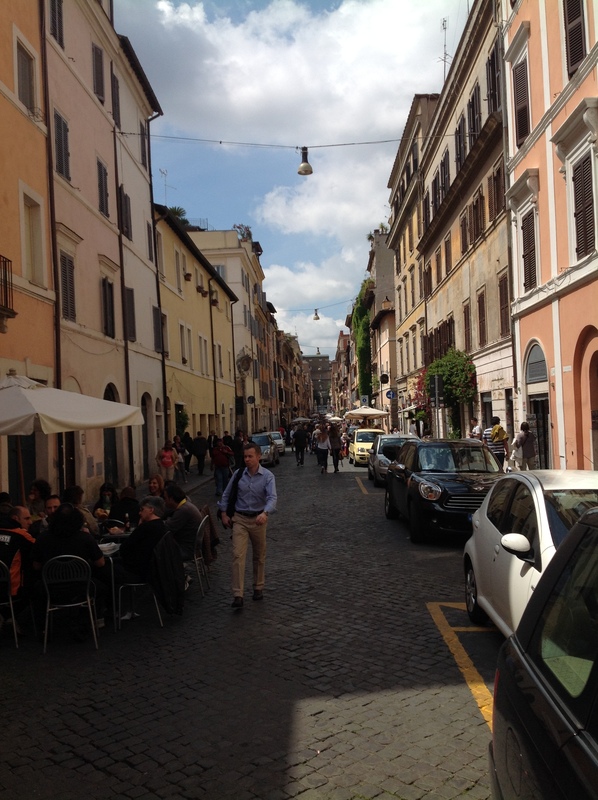 I had a quick coffee with NCR reporter Joshua McElwee, and then, after meeting with brother deacons Rob Mascini (the Netherlands) and Enzo Petrolino (Italy), I wandered over to the Borgo Pio, one of my favorite streets in Rome, just around the corner from St. Peter’s. Always a fascinating place people watching! There was even some nice music for pranzo. . . .
After wandering around this morning and early afternoon, with the temperature rising fast, I stopped outside the Libreria Editrice Vaticana (bookstore) near the Vatican Press Office for a lemonade. Soon a couple came up and asked me in halting Italian if they could sit down as well! I answered “sure” in my best Midwestern English, and met a delightful couple from Chicago. While they are thrilled with the canonizations in a general way, they’re really hoping to encounter Francis. This seems a very common response. People are happy for the two popes being canonized, but in the hearts of many, Francis is already a saint as well, and he’s still with us! One of the most common images (of which I have many in my bag already) shows the two new saints flanking Pope Francis who is in the middle and slightly elevated over Pope John and Pope John Paul II. My new friends told me that this was their first ever trip to Rome, but that they were already looking forward to coming back when things would be less hectic. Among all the various national groups, the one that stands out are the Poles. As one person put it to me, “The Poles are back!” There are signs and songs and shouts all over the place; I can only imagine what will happen tomorrow when Pope John Paul II is announced as “Saint John Paul.” But Pope John is not forgotten. 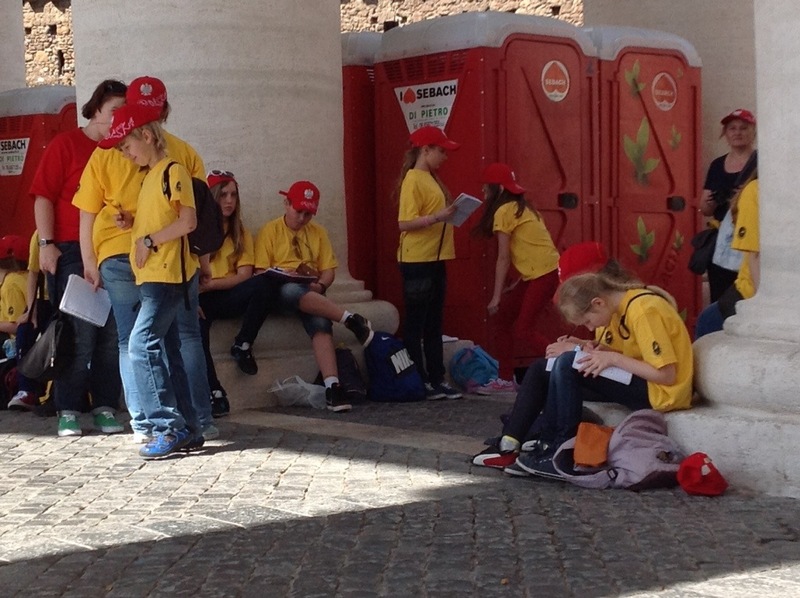 I saw several groups of people John’s home diocese of Bergamo: from young and old, clergy, religious and laity, all of whom are literally camping in St. Peter’s Square. Although the police are trying to tell people they can’t do that, no one has yet started removing them either. It will be interesting to see what happens on that score as well. I had a delightful conversation with CNS reporter Carol Glatz and then decided to grab a taxi and return to our lodgings and rest for tomorrow. But, with every respect to my friends and colleagues, the highlight of the day was about to happen, completely by chance. The Via della Conciliazione is now a pedestrian thoroughfare. People are simply walking up and down the whole length of the street, and the only motorized vehicles allowed now are related to public safety. Along the way, I encountered this delightful group of children being entertained by some local workers. Enjoy the video. It makes my day every time I watch it! I have come back to the religious house where I’m staying where they young rector from the Congregation of Mariannhill Missionaries (CMM) and I took a light supper in the kitchen and talked about many things. Born and raised in South Africa, Fr. Musa is excited about the new energy being found in and about the church. He won’t be able to attend the canonizations tomorrow because he serves in several parishes on the weekend, but he asked for special prayers at the canonization and promised his in return. The house has pilgrims from the United States (well, just me), the Netherlands, and Germany. 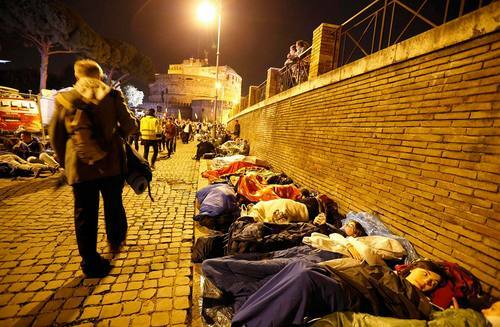 There was a young woman from Michigan staying here, according to Musa, but she called him to say that she was going to camp out in St. Peter’s Square tonight. As for me, I will be getting up at 2:45 AM. Sister Philomena, the 84-year old dynamo who runs the kitchen, is putting out some breakfast things for me tonight, and Musa is getting up to arrange a taxi at 3:30 AM. (The taxi company wouldn’t arrange things in advance!). He said it was his way of participating in the event. I’ll take the taxi to Saint John Lateran to pick up the bus which will take us to the edge of Vatican City. There we will be met by officials from the Vatican’s Pilgrimage office at 5:00 AM and escorted to the church of Santa Maria in Traspontina to await the Mass and our service as ministers of communion. So, it’s off to bed for a few hours sleep. Tomorrow will be an incredible day! Oh, and the forecast calls for rain and storms, but only AFTER the conclusion of the Mass. We shall see. . . . It was a busy day today, and these scattered thoughts reflect some of the craziness that’s building around here. It was still another gorgeous Roman day. 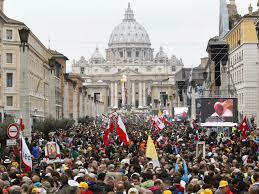 As I entered the Piazza San Pietro, it was obvious that the crowds are building in both numbers and intensity. There were long lines yesterday to get into the Basilica, but nothing like today! The queue wrapped around the piazza and into the Via della Conciliazione. The crowds today were often celebrating in parish, organization, or even national groups. One sizable group had brought in a large wooden cross, secured it in a stand, and serenaded passersby with a variety of songs and hymns for at least an hour. Other groups were singing around the Square as well. I would estimate — very unofficially — that the crowd in the Square today was at least triple what was there yesterday — and tonight, a deacon friend from Rome told me that they are now estimating as many as five million people to be “attending” the canonization ceremonies at venues all over town. One group today was practicing their “John Paul II, we love you” chant, although I didn’t hear a similar chant for Pope John. The press scaffolding next to the Vatican Communications Office seemed quite crowded today, much more so than yesterday. 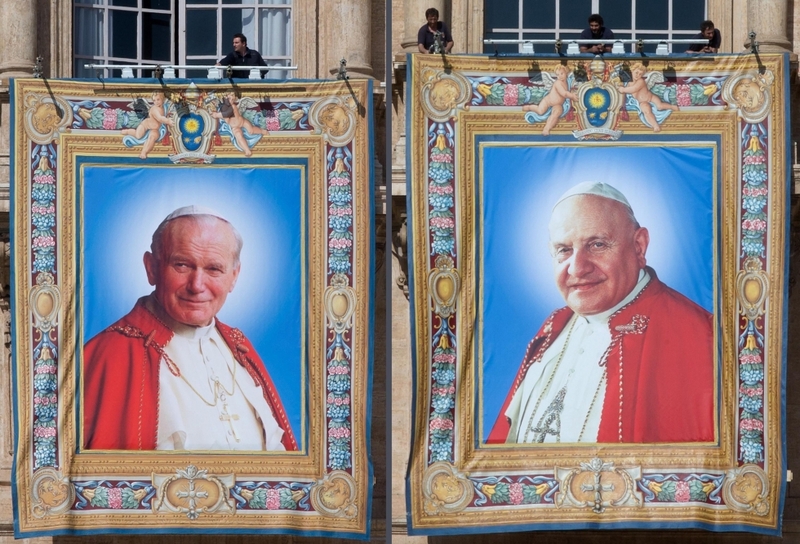 Perhaps the most visible change of all today, however, was the hanging of the tapestries with the portraits of the two new saints from the front of the Basilica. They’re not hanging together like this; that’s just a camera trick. St. John is on the right side of the Basilica and St. John Paul is on the left side of the Basilica. The tapestries seem smaller than what I would have expected when you see them against the full size of the Basilica, but maybe that will change for Sunday! Before going on, I’d like to add a bit about Pope John. 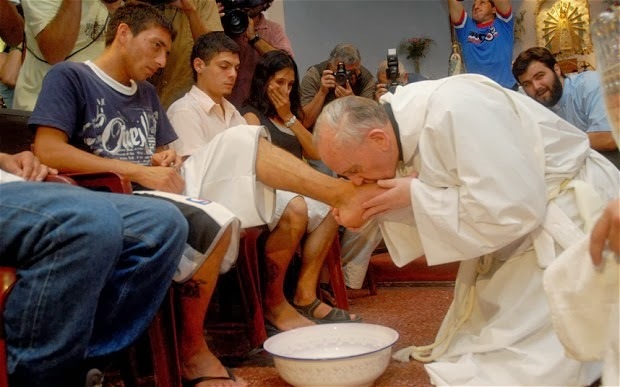 Personally, I am sorry that so many people have forgotten just how popular, inspiring and influential Pope John was in his day. When he died on Pentecost, 1963, a proposal to proclaim him a saint immediately, “Santo Subito”, was chanted by the people and circulated among the world’s bishops who were preparing to return to Rome for the second session of the Council. It was proposed that the Council itself, when back in session, make the proclamation of sainthood (under the leadership of Pope John’s good friend and successor, Pope Paul VI). Although Pope John was extraordinarily popular and beloved for his simplicity, humor and pastoral concern, the bishops decided that to proclaim him a saint immediately would be unseemly; there also seemed to be a sense that it would be better to wait until “Pope John’s Council” was successfully concluded as his legacy before proceeding further. Obviously, these are two very different men, and this is not a popularity contest! 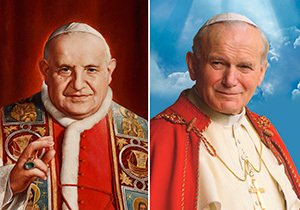 Still, I hope that younger people who have really only known St. John Paul II and his recent successors might be inspired by this canonization to study and learn about St. John XXIII and Pope Paul VI. To understand where we are today on many levels in the Church, a person really needs to understand those two popes of the Council and the first years of its implementation. As I wandered around the Square talking with people, and later in conversations with friends, there was a general enthusiasm about the leadership of Pope Francis, his genius at linking these two new pope-saints, and his own unique stamp on exercising the Petrine ministry. The only concern raised was that he has made himself so open and vulnerable that he may be attacked! 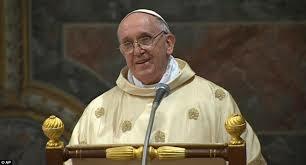 The numbers at his Wednesday audiences are stunning, and he has begun the audiences much earlier, arriving in his popemobile sometimes as early as 9:30 AM so he has more time to meander through the crowds before taking his position on the platform for the formal portion of the audience. Finally, a brief word about the instructions we’ve received for Sunday. I must leave the monastery in which I’m staying at 3:30 AM for the trip to St. John Lateran. 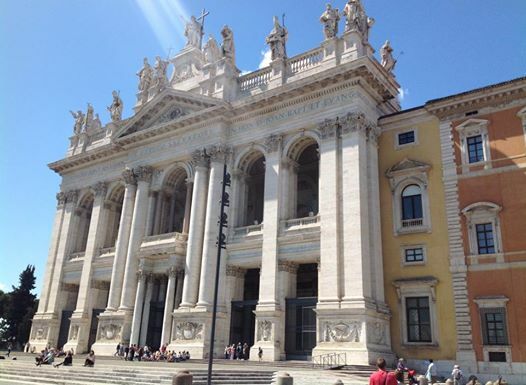 I have included a picture of St. John Lateran in bright sunshine which I took yesterday; that’s not a view I’ll have at 5:00 AM on Sunday morning! At some time between 4:30 and 5:00 AM, a special bus will take us priests and deacons who are distributing communion from the Lateran to the church of Santa Maria in Traspontina at the other end of the Via della Conciliazione from St. Peter’s (a week ago, we were told the bus would leave at 5:30; that’s been changed. Maybe by Sunday, it will change even further. I intend to be there in plenty of time!). At Santa Maria we will vest in alb and white stole and wait for the Mass of Canonization to begin at 10:00 AM, when we will make our way out the front doors of the church into the Via della Conciliazione. Eventually, we will distribute Communion to those communicants in the area. We have been told to distribute communion only on the tongue (actually, the instructions say “data in bocca” (given into the mouth), in order to prevent someone from taking the Host in the crowd and giving it to another. I’m going to St. Peter’s tomorrow morning; it will be interesting to see what happens next as the numbers build along with the excitement! First a word on the tourist stuff. We landed in Rome right on time. It was 7:30 Rome time, not even close to my own body clock. But I had slept well on the flight, so I’ve been going strong ever since; as I write this it’s now 3:00 PM in Rome. 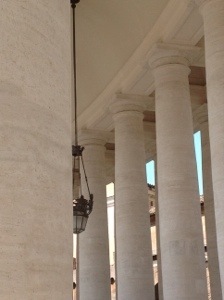 I’m sitting at the base of one of Bernini’s great columns waiting for a deacon-friend to arrive from the Netherlands. Sitting near me, the next column over, is a group of young Polish students. For the last hour they have been sitting quietly writing in their journals about their experiences. Wouldn’t you love to read what they’re writing? The Roman traffic today didn’t seem too different from the norm, except that the times posted at the bus stops have long since gone from pleasant, civilized suggestions to complete fictions! And then we turned onto the Via della Conciliazione! Unbelievable! Where taxis used to queue is now blocked off, largely by press vans. The taxis are now ranked up and down the street. There are huge lines getting into the shops and cafés. My one task for the day was to pick up the credentials needed to assist with Communion during the Canonization Mass on Sunday. That involved getting to the Vicariate of Rome, finding the right office, presenting the necessary documentation — all before the deadline, which was noon! I’m happy to report that the mission was accomplished, and I have those invaluable papers and the instructions that go along with them. More details to come. There’s great excitement in the air. Reporters are everywhere, getting interviews. In fact, my young Polish friends were just led off to give an interview themselves. 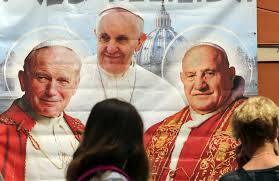 Images of John XXIII, John Paul II, and Pope Francis are everywhere. And the day is still young! In a few hours I’ll be on a flight heading to Rome for the solemn canonizations of St. John XXIII and St. John Paul II on Sunday, 27 April. It is no hyperbole to say that every journey to Rome is an adventure. This one will be made even more so because of the great popularity of the two popes being declared saints. I’m on the list, along with dozens (hundreds?) of other deacons and priests, to assist with the distribution of Holy Communion to the huge assembly which is already gathering in St. Peter’s Square and beyond. 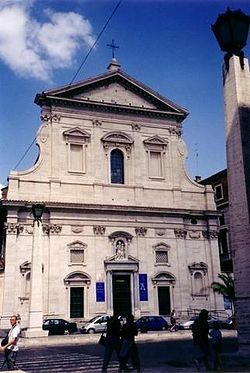 I’ll have more details to report once I get there and pick up my credentials at the Vicariate of Rome near the Basilica of St. John in the Lateran. To be honest, I have a great hope that I’ll be assigned to serve outside of the Square. The Via della Conciliazione is always busy, with the shops, cafes, hotels, congregational headquarters and offices, the buses, cars and taxis, and the wall-to-wall people. I can’t imagine what it’s going to look like on Sunday, but I hope that I’ll be distributing Communion out there in the middle of it. My guess is that the Via will be full of folks who want to be at the Mass but won’t be able to get into the Square, or weren’t able to get tickets to sit or stand closer to the papal altar. They will follow the Mass as best they can, and those of us serving will go and serve them right where they are. 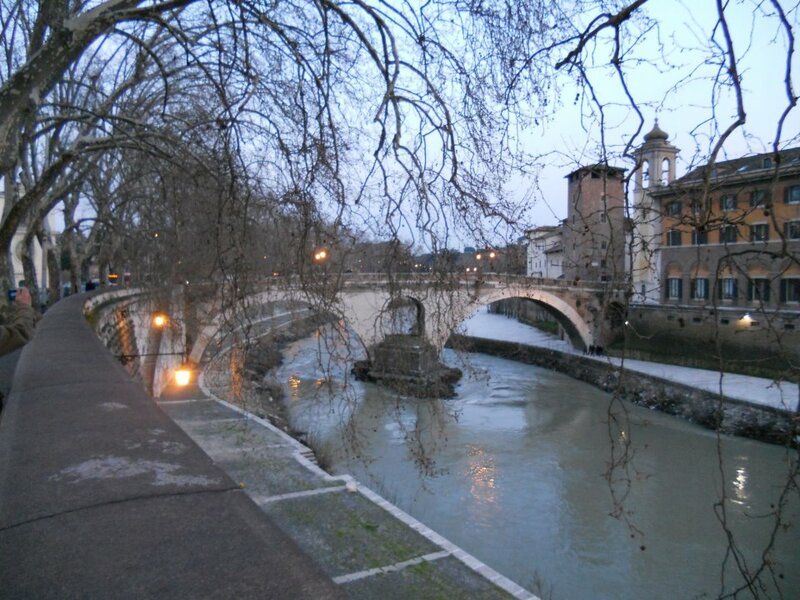 Who knows, maybe we’ll be standing on the bank of the Tiber! I’ve also been thinking about how quickly things can change. A few years ago I was in Rome for meetings. A good friend of mine from high school seminary asked me to find some kind of religious item with the image of Pope John XXIII: a medal, a rosary, a small statue. For folks of our generation in the seminary, Pope John was a particular favorite for us. He was as influential on us as Pope John Paul would be to later generations of seminarians. However, as I wandered around the shops near the Vatican, I was truly amazed to discover — nothing! I found, of course, plenty of things with Pope John Paul II’s image, and Pope Benedict’s, even items with other popes, like Pope Paul VI and Pius XII. 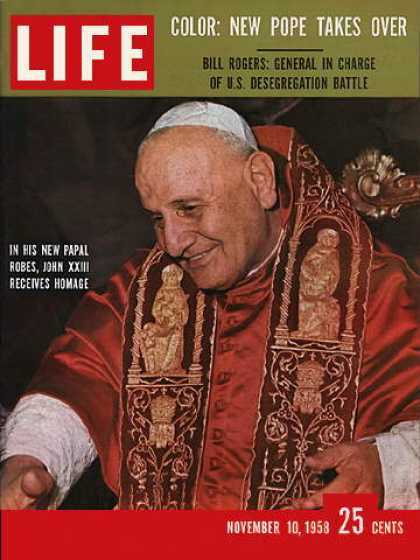 But there seemed to be absolutely NOTHING remembering Pope John XXIII. Finally, as I was about to give up, I wandered into a little shop and was waiting for the shop owner to finish a phone call so I could inquire. While waiting, I glanced into a back room in the shop and found two small statuettes of Pope John! They were covered in dust and had clearly not been on public display for years. I think the owner was glad to finally be rid of them. My guess is that on THIS trip, I’ll find plenty of items for both John as well as John Paul! I’ll keep you posted! There are few constants in life. One of them, however, is this: Whenever the subject of clerical celibacy in the Catholic Church is raised, everyone has an opinion to share. And when “celibacy” is linked to something said by the Pope — well, all bets are off! So, naturally, here I am, entering the fray again because, as part of my opinion, most commentators miss the real point. The current round of discussion began yesterday when a Brazilian Bishop Erwin Kräutler, Bishop of Xingu, reported a recent audience with Pope Francis in which the pope suggested that various approaches might be explored at the initiatives of regional and national episcopal conferences. Read one report of the interview here. 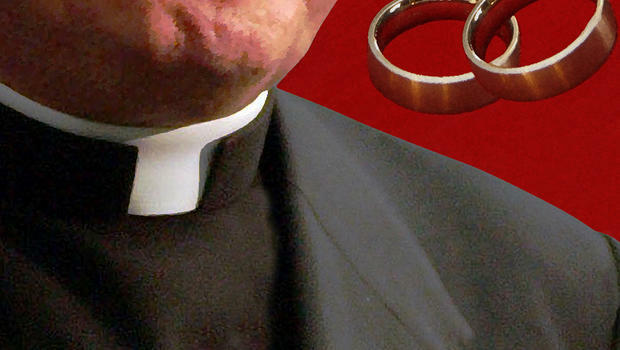 This includes the possible ordination of viri probati (“proven men”), which generally refers to experienced married men. You can read Deacon Greg Kandra’s reporting on the interview here. The comments on his Facebook page reflect the normal range of responses. Some paraphrasing: “Celibacy is just a discipline, so let’s dump it.” “Celibacy is the ideal which needs to be protected.” “Celibacy should remain the norm; we could let some married guys into the priesthood, but let’s not get carried away.” “Sure, you can drop celibacy, but it would break the church because married priests will cost more.” And on and on. Don’t get me wrong. These are all interesting questions: what does it mean to speak of something as a matter of discipline and (consequently) potentially changeable? Why is clerical celibacy to be understood to be “the norm” when our history and the diversity of the Church’s praxis in both the Western and Eastern traditions tells us otherwise? 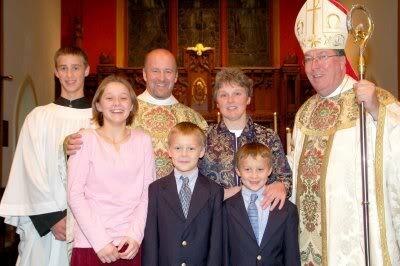 And more than one diocese has undertaken to examine the costs involved when the pastoral leader of a parish (deacon or layperson) is not a priest: would it really cost the diocesan church more? What these studies have found is that, while the actual salary of a priest is minimal, when the other allowances made regarding housing, food, and so on are taken into account, there is much less difference than one might assume. Each of these questions, and so many more, need to be addressed. But there is, in my opinion, a much more fundamental issue involved here. The hand-wringing on both ends of the spectrum miss a point that can actually bring them closer together. No serious commentator I know is saying that we should “do away with celibacy.” For those persons who have the gift (charism) of celibacy, they should be encouraged, whether they are considering ordination or not. This charism has found its longest expression, not in the ordained ministries, but in vocations to religious life. Sisters, brothers, monks, nuns and friars have, from the beginning, discerned the counsels of poverty, chastity and obedience as the bedrock of their vocations. The fact that some religious men later entered the ordained ministries began to confuse the issue. Let’s see this point in practice. One of the comments on Deacon Greg’s Facebook page makes the common point that in the Eastern traditions, deacons and presbyters are married, but the episcopate is celibate. This point is frequently made, mistakenly, that Eastern bishops are expected to be “purer” than their more “junior” colleagues. However, the source of that practice lies in the fact that the Eastern traditions tended to call their bishops from religious orders (in which all the members had taken vows of poverty, chastity and obedience); in the West, it is far more common (while not universal) to call our bishops from the diocesan clergy. If the Eastern traditions followed this practice, some of their bishops would be married as well. One further observation: As a married deacon (married for nearly 43 years, ordained for nearly 25 years), I think there’s another benefit to this discussion which is often overlooked. Certainly we have a strong tradition in the Latin Church which values celibacy’s current relationship with the clerical state. Celibacy, as beautiful as it can be, has never been considered to be a sacrament of the Church. Matrimony, on the other hand, is a sacramental way of life. 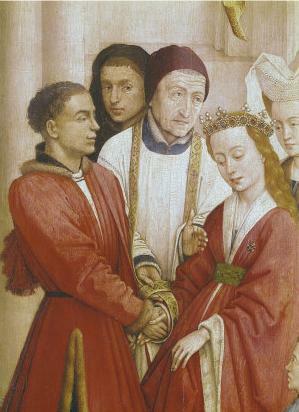 Just as celibacy can offer an eschatological meaning to Orders, so too would a clergy witnessing the sacramental graces of the sacrament of Matrimony. The Church is entitled to all of the charismata given to the Church by the Holy Spirit, and a clergy that reflects how the ordained ministries model the great diversity of these gifts, can be a powerful witness to the world. During his daily homily yesterday, the Pope spoke of the need to avoid a “dictatorship of thought” and echoed the call of every other Pope since St. John XXIII: that what is needed in today’s Church is a novus habitus mentis: a “new way of thinking.” The pope is reminding us all very clearly and strongly that this new way of approaching things continues to be necessary. As a truly “catholic” church of “both-and”, we can find a variety of ways to approach the clerical state, ways which value the variety of charisms given to the Church by God.